Dogs like Rocky love swimming in the warm water pool. Rocky, 1 year after back surgery. Dogs love swimming in this heated pool. Your dogs can enjoy this large, heated, enclosed dog pool year round. Designed to accommodate dogs of all sizes. This dog pool is perfect for dogs preparing for or recovering from surgery, dogs doing fitness training, dogs regaining health and just for fun. Happy, healthy dogs are our passion. Comfort and peace of mind for you and your dog are the top priorities at Happy Tails Resort & Spa. Happy Tails Resort & Spa was designed to create a home style environment to make your dog's visit his own vacation - his home away from home. Play time for dogs Reicher, AC and Cooper. 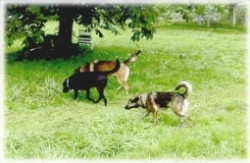 Your dog will enjoy playing in the huge fenced yards, swimming, exploring and other activities. With so much to do all day, he'll eat well and sleep well on his vacation at Happy Tails Boarding. You'll enjoy your time away from home knowing your dog is happy and healthy at his home away from home. 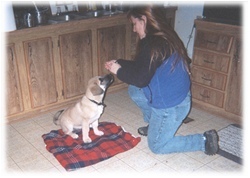 Cabo learns to "wait on your rug"
Thank you for the opportunity to care for your dogs. Many of you have put your dogs in our care for over twenty-five years. It is our highest honor to have your trust and it is our joy to care for your dogs. Every year countless clients refer friends and acquaintances to Happy Tails - thank you. Meet the Happy Tails Resort & Spa team. Check out this helpful puppy information. 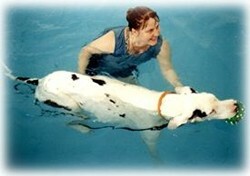 Learn more about the dog pool, dog boarding, make a reservation or contact us for additional information. Bookmark this page or save it in your favorites.